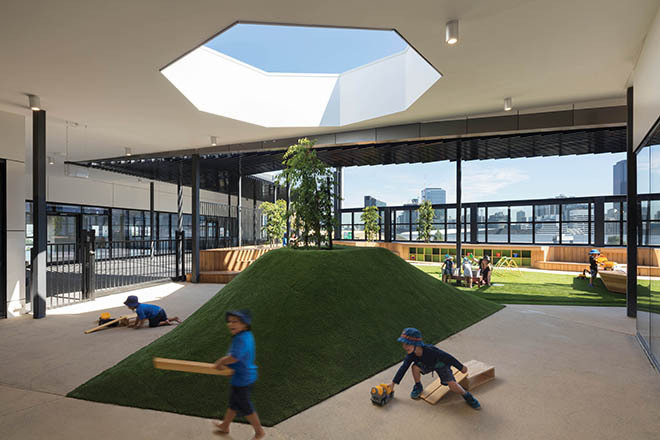 The gritty formerly industrial area around Fisherman’s Bend in Melbourne’s inner south continues its gentrification with the jewel in the crown, South Melbourne Primary School, now open and teaching its first cohort of kids. The school was completed in two years and over 160 students have arrived for term one. Located on a compact inner urban site of just over 0.5 hectares on Ferrars St South Melbourne, the school is positioned in the Fishermans Bend Urban Renewal Area which is growing by 3,000 residents per year. The six-level building will eventually house over 525 primary school students, 44 early learning students, and a number of community services and facilities integrated with the support from the City of Port Philip. Some of the features at South Melbourne Primary School include social and recreational areas provided for the community like: a maternal and child health centre; community meeting rooms with access to a kitchen; a 44-place Early Learning Centre; and an expanded gymnasium equipped for competition-grade indoor sports. “The staircase is a vertical piazza that acts as a meeting space, teaching space and in some parts, doubles up as auditorium seating,” said Mr Leonard. Teaching spaces are arranged around “learning communities” to facilitate both aged-based and stage-based learning groups. 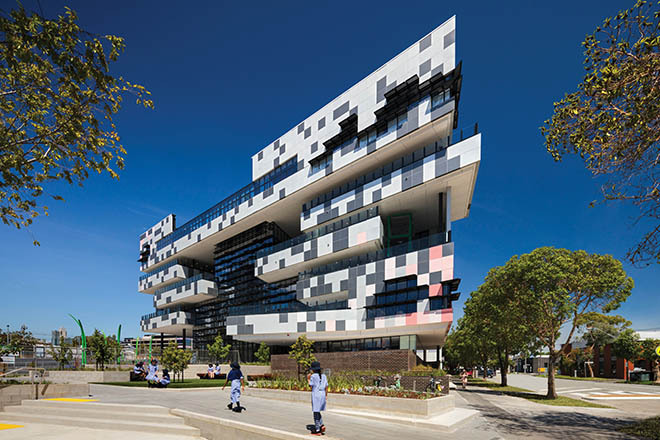 The building layout is characterised by varied, student-centric spaces that connect internally and flow seamlessly between multiple indoor and outdoor areas at every level. There isn’t a playground per se but there are sufficient outdoor play areas that encourage active learning. “Above the indoor gym, we have an outdoor sports area so kids can play typical ball games they love – of course there’re nets surrounding the play area so balls don’t fly off the roof! 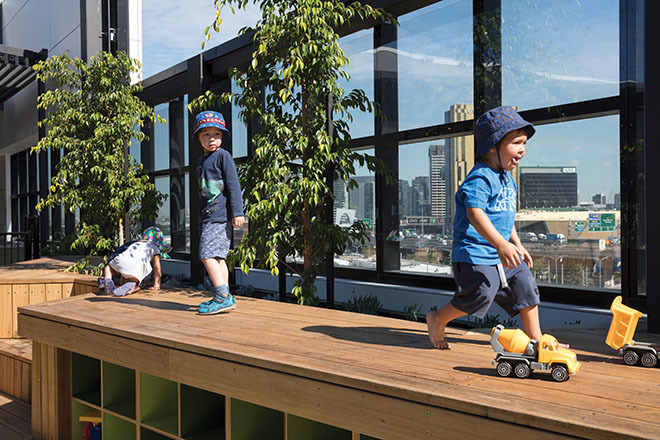 “There’s also a climbing play structure called ‘The Treehouse’ which allows vertical connection between the outdoor learning areas on levels two and three, promoting exercise and active play as well as connecting levels.